When it comes to coaching football, Bill Belichick is in a league of his own. Hall of Fame NFL coaches and players have praised the depth, breadth, and adaptability of his playcalling and his encyclopedic knowledge of the game. He's known as a dedicated leader, dispassionate manager, and perhaps most of all as a winner. As of 2018 Belichick has led the New England Patriots to eight Super Bowls in 17 years and won five of them since becoming the head coach in 2000. If you count his years as a defensive coordinator, then Belichick has contributed to nine of New England's 10 Super Bowl appearances and coached in 21.2 percent of all Super Bowls in NFL history thus far. While Bill Belichick's coaching ability can't be overstated, some might say the same about his personal and professional shortcomings. He's done and been accused of some extremely unsavory things, and people tend to find him pretty unlikable. Even longtime Patriots wide receiver Julian Edelman, who owes his career to Belichick, said, "He's an a**hole and I hate him a lot of the time, but I love him." Love him or hate him, he's had a fascinating and at times scandalous life. 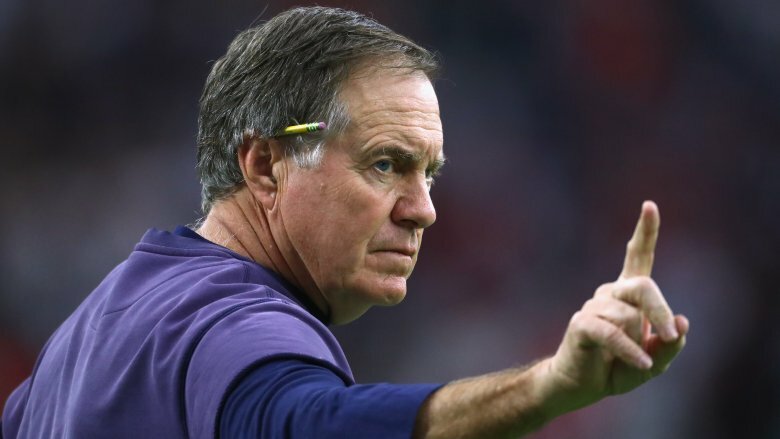 NFL writers and football junkies may disagree on whether Bill Belichick is the greatest NFL coach of all time, but there's no denying he's had a legendary run. The only thing more surreal than Belichick's coaching accomplishments is that fact that they probably wouldn't have happened if his dad's career plans hadn't imploded. Belichick's template for success was his father, Steve, who was a college football coach for 43 years, per ESPN. But if things turned out as Steve envisioned in high school, he would have worked at a steel mill all his life. 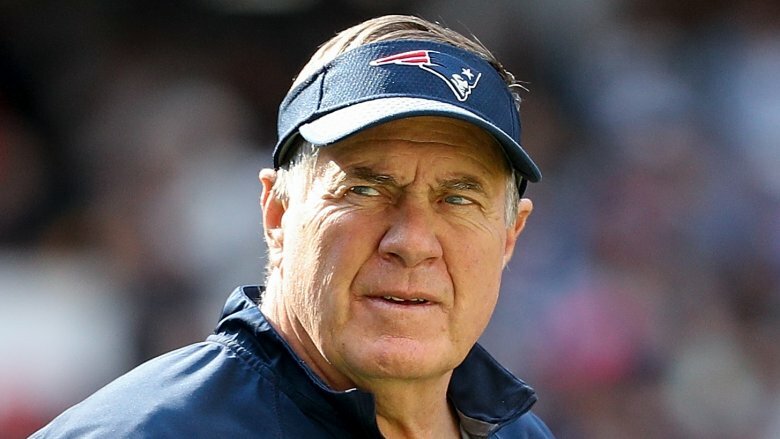 As Boston.com explained, Bill Belichick's father grew up in Pennsylvania and witnessed the ravages of the Great Depression as a teenager. His family eked out a hungry and cash-strapped existence, and Steve got a job at the local steelworks while in school. He figured he'd just do that forever, but the economy intervened. The steel mill went kaput, leaving Steve in dire straits. Luckily he excelled at football. A college coach helped him land a college scholarship, and he would play six games in the NFL as a Detroit Lion. Steve put football on pause to join the Navy and fight in World War II before eventually landing a coaching position at the U.S. Naval Academy. Bill Belichick would spend his childhood learning from and admiring his dad. Bill Belichick started learning about football when he was knee-high to a punter. "He was probably 5 or 6 when he first got interested," his father recalled. That interest was born of young Bill's desire to bond with his father, who spent 33 years as an assistant coach at the U.S. Naval Academy. Steve analyzed football films with his son and let him tag along when he was scouting opponents. Each week Bill received a copy of the plays Navy planned to use in the upcoming game. Bill also observed the coaches his father worked with. In 2017 he recalled: "Going to practice gave me a great opportunity to see a number of great coaches that were at the Naval Academy. … There were dozens of them at all the positions. Each guy had a different style and a different way of doing things." He absorbed so much information that he started drawing plays on his own. By age 13 he "mastered scouting film," according to UPI. By the time he got to college Bill Belichick already had practical coaching experience. His father ran a football camp, and Bill, by his own admission, "was not a real good player." So he attended coaching meetings and learned the ins and outs. He basically spent his childhood as an apprentice preparing for his career. Before 1984 the now-Indianapolis Colts played in Baltimore and were one of the few NFL teams whose games aired on television in Belichick's hometown of Annapolis, Maryland. 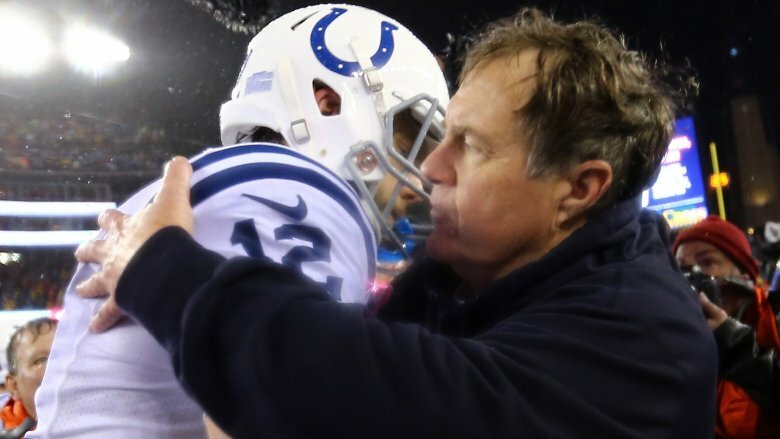 Growing up, Belichick loved the Colts. He told NESN that he memorized their starting lineups and met legendary Colts players like Johnny Unitas through his father's football camp. Later, the franchise gave him his first NFL job. It was 1975 and Belichick had his heart set on becoming a football coach, so much so that according to Bleacher Report, he turned down a job offer from Procter & Gamble after graduating college. Instead he sent 250 letters to coaches who rejected him. Luckily, Colts head coach Ted Marchibroda gave him a chance. Belichick was eager to do his job even before he knew what it was, declaring, "You don't even have to pay me — just give me something real." Belichick worked as a gopher for $25 a week. He served as the film guy and collected playbooks from athletes who got cut from the team. Marchibroda later remarked that Belichick "was willing to work 'round the clock for nothing and learn everything he could about the game." However, some Colts players found Belichick gratingly arrogant and didn't think he belonged in their world of gridiron hulks. 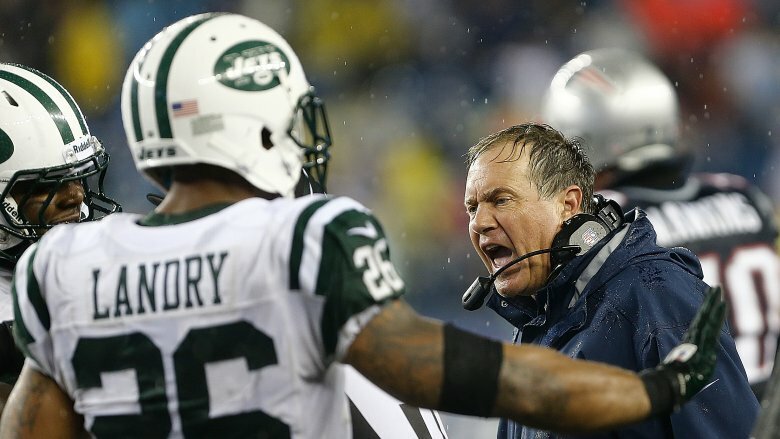 Belichick considered his abrasiveness a necessary evil, a way to earn respect from the tough guys around him. In 1991 the Cleveland Browns hired Belichick as their head coach, a position he'd never held before. It was a time of trial and error, but mostly error. Belichick hampered the Browns by declining to hire an offensive coordinator. He received death threats for canning a popular quarterback. In his five years with the organization, he had four losing seasons, per the Washington Post. 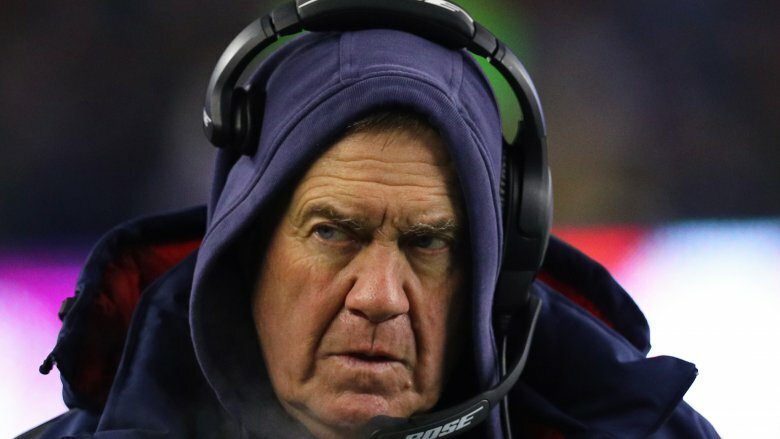 Behind the scenes Belichick assumed the role of tyrannical schoolteacher. He assigned summer reading to his assistant coaches and quizzed them on the material. He made them analyze the unlikeliest scenarios and give presentations on how to handle them. Multiple staffers complained and at least one quit. 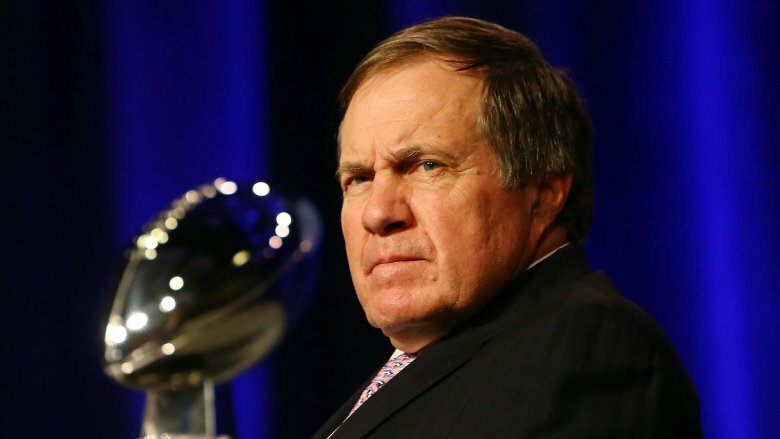 Belichick would end up leaving, too, when it became clear his job was on the chopping block. Belichick's first head coaching job was a five-alarm dumpster fire, but it wasn't fruitless. He told NBC Sports that during his time in Cleveland he developed his own system for scouting and evaluating players and would do likewise in New England. He also started treating the press differently. As Bleacher Report explained, before becoming a head coach, Belichick spoke openly to journalists and even diagrammed plays for them. However, in Cleveland he worried about how much strategic information could be gleaned from media reports. It marked the beginning of the evasive and standoffish Bill Belichick who greets reporters nowadays. Whoever said "violence is never the answer" was probably never asked questions about football. (No, flag football doesn't count.) The solutions to most pigskin-related problems involve some form of hitting. Even the ball gets kicked. 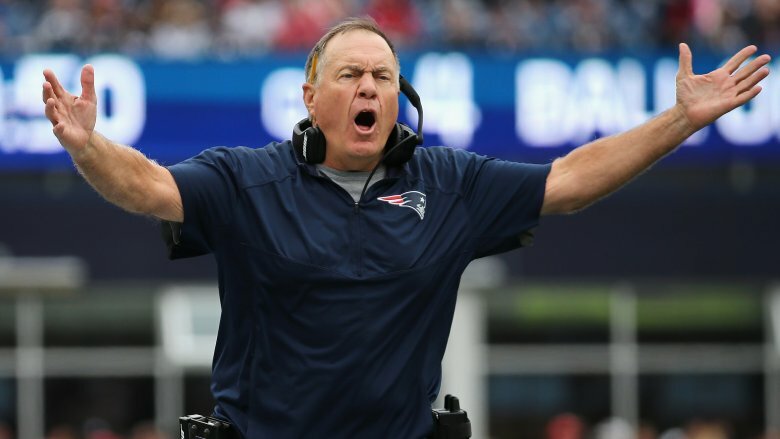 In fact, former NFL lineman Chad Eaton claimed that Bill Belichick, arguably the most resourceful mind in football, secretly instigated fights to energize players. Eaton played on the Cleveland Browns practice squad in the 1990s when Belichick was at the helm. In a 2011 interview he said that when the players lacked pep at practice, Belichick told him to "start a little fight." Supposedly, Eaten would later find money in his locker. When asked about these assertions, Belichick responded, "I don't remember that," which technically isn't a denial. In 2000 the Boston Globe reported claims by unnamed sources that Belichick did something similar while coaching the Patriots. Supposedly, he paid lineman Rob Gatrell to tick off "the most emotional, toughest, and meanest player on the defense," resulting in a 30-man brawl. The team's spokesman acknowledged that the fight happened but pleaded ignorance about the alleged payment. Belichick denied engineering the melee, declaring, "No. We had an intense week of practice." Before turning New England into a giant pile of championship rings, Belichick spent about a bajillion years working alongside Hall of Fame coach Bill Parcells. Per ESPN, they first joined forces in 1979 when Parcells was an assistant coach for the New York Giants and Belichick ran the special teams unit. Parcells would become a head coach while Belichick would serve as his defensive coordinator on the Giants, New England Patriots, and New York Jets. According to USA Today, "Parcells was a total jerk to Belichick." As the Giants' defensive coordinator, Belichick played a crucial role in winning two Super Bowls in five years. But as Bleacher Report recounted, Parcells hogged all the glory, and in addition to overshadowing Belichick, he bullied him. The ugliest instance of bullying occurred while they were coaching the Jets. Years prior Belichick had a flushable tenure as head coach of the Cleveland Browns, and Parcells appeared to rub it in during a game. After Belichick proved him wrong about a play call, Parcells tore into him over open mics: "Yeah, you're a genius, everyone knows it, a godd*mn genius, but that's why you failed as a head coach — that's why you'll never be a head coach … some genius." Ironically, when Parcells retired from the Jets, he handed his head coaching job to Belichick, who stepped down after one day and went to New England. 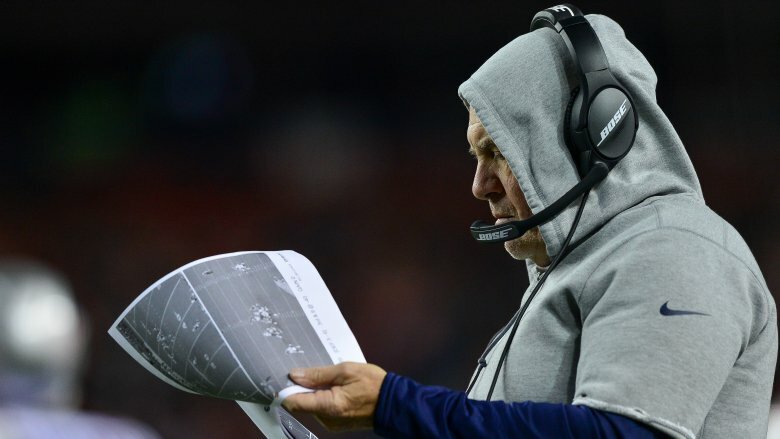 Belichick wrote his resignation letter on a napkin. When you play for Bill Belichick, the minimum expectation is maximum effort. 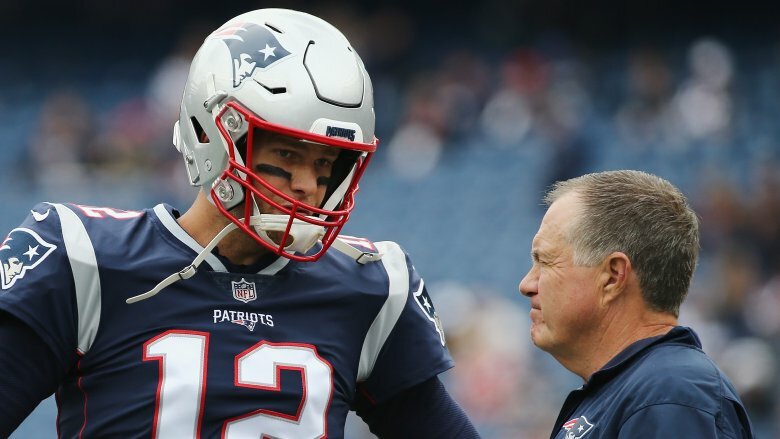 According to former NFL lineman Geoff Schwarz, players who disappoint Belichick risk getting chastised at team meetings, benched during games, or traded, regardless of position or talent. So when he gives a player an order, they should probably follow it if they want to keep their job. But for Ted Johnson, obeying Bill Belichick meant risking his career and his health. Johnson was a linebacker for the New England Patriots and contributed to three of the team's Super Bowl victories. As the Associated Press detailed, in 2002 he sustained a concussion during a preseason game and was instructed by the team trainer to take it easy. Four days later he got a second concussion at practice. Johnson would later blame Belichick, telling him, "You played God with my health. You knew I shouldn't have been cleared to play." He also alleged that the coach took responsibility during a one-on-one exchange. Regardless of what Belichick may have uttered privately, he publicly placed the onus on Johnson, arguing, "If Ted felt so strongly that he didn't feel he was ready to practice with us, he should have told me." Johnson would suffer more concussions in subsequent seasons but kept quiet about them for fear of seeming injury prone and getting benched. A few years after retiring, he started displaying symptoms of irreversible brain damage and early-onset Alzheimer's. 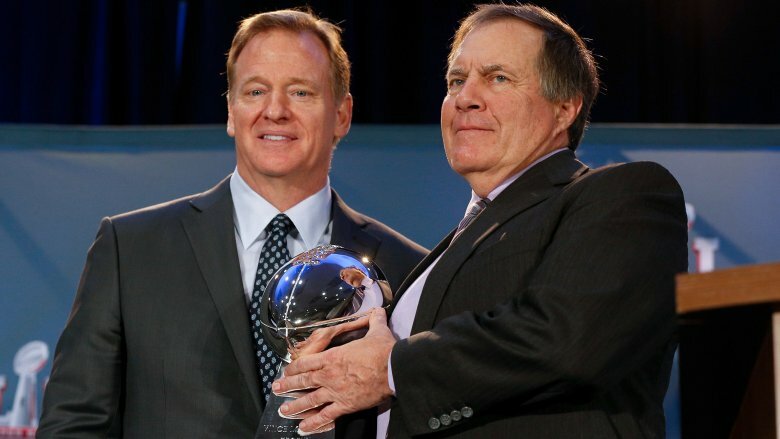 In 2007 Bill Belichick was implicated in not one but two separate cheating scandals. One of them was Spygate, wherein he tried to win NFL games with underhanded tactics. The other involved him possibly becoming a married woman's sugar daddy. Admittedly, the latter seems more surprising. Belichick doesn't sound like the type to dote on anyone. After all, Tom Brady, the coach's football husband for roughly 20 years, has described him as a "disciplinarian" who rarely gives compliments. That doesn't scream "sugar-daddy" so much as "daddy, why don't you love me?" But as the New York Post detailed, he was jaw-droppingly generous to Sharon Shenocca. Belichick and Shenocca first crossed paths in the 1980s, when she was a receptionist for the New York Giants, and he was the defensive coordinator. Apparently they really got along because Belichick paid for Shenocca and her sister to watch the 2004 Super Bowl in person, and it was hinted that he and Shenocca shared a hotel room. Belichick also paid for her to have a personal trainer and footed the bill for trips to Jamaica, Puerto Rico, Disney World, and a couple of spas. None of this sat well with Shenocca's husband, who decided to untie the knot. In 2007, during divorce proceedings, Shenocca testified under oath that Belichick sent her $3,000 monthly for 18 months after her husband cut her off financially. Former Patriots tackle Nate Solder characterized his experience in New England as "very business-like" and occasionally "cold." Considering that Bill Belichick majored in economics, it makes sense that he'd value efficiency over friendliness. Yet when asked how much he used economics in his coaching career, the unsentimental mastermind replied, "For the most part, probably 1 percent." However, economics reporter Paul Solman (who posed the question) argued the percentage is far higher. Solman made the case that Belichick relies on the economic concepts of opportunity cost and convex preferences when constructing football teams. Simply put, opportunity costs are what you lose when you choose something. For example, the more money a team pays for a star athlete, the less it can pay for other athletes. That's where convex preferences come in. The basic idea is that when you have a fixed budget, you don't want to purchase too many expensive or dirt-cheap items. Applied to building football teams, it means you're better off with a lot of medium-priced priced average players than with a few high-priced stars and a bunch cheap terrible players. 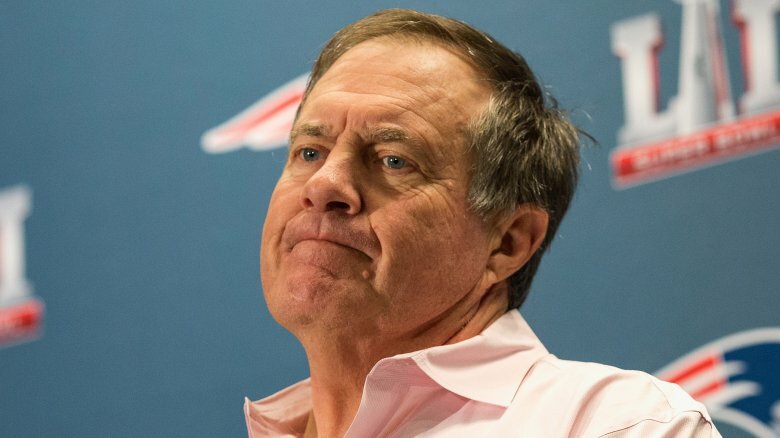 The Patriots are famous for acquiring mostly average players, and Fox Sports noted that if an elite player wants to work for Belichick, they have to accept less money than they'd earn elsewhere. As of this writing 43 NFL players have higher salaries than Patriots quarterback Tom Brady, who's won more championships than any of them. When it was discovered in 2007 that New England Patriots, under the direction of Bill Belichick, had been taping opposing teams' sideline signals to decode their plays, the news spread like mono at a kissing booth. Belichick claimed he "misinterpreted the rules" and got slapped with a hefty fine. NFL commissioner Roger Goodell had the tapes confiscated and destroyed. The following year Goodell described the spying as an uncommon occurrence that "probably had a limited effect, if any effect, on the outcome on any game." However, according to ESPN, that might have been a steaming pile of non-Cleveland brown. Contrary to Goodell's assurances, a former Patriots video assistant went on the record as saying that Belichick had been taping other teams' sideline signals since 2000. And that was just the tip of the iceberg. Former assistant coaches and ex-staffers for the Patriots admitted to stealing play sheets from opponents' locker rooms. They also searched visiting teams' hotels rooms for playbooks and scouting reports. A former member of the NFL competition committee told ESPN that the committee had been regularly "discussing ways in which the Patriots cheated" since 2001. Teams complained about the Patriots' underhanded tactics for years, and famed quarterback Peyton Manning refused to discuss plays in the team's visiting locker room because he suspected it was bugged. Some have speculated that the Pats got a pass because owner Bob Kraft and Roger Goodell were extremely tight. In public Bill Belichick is about as cuddly as barbed wire. Eliciting joy from him seems like such a herculean task that in 2018 Sports Illustrated counted how many times he "genuinely smiled" during Super Bowl media day (33, in case you were wondering). In fact, preteen junior reporters, a professional comedian, and comedic actor J.B. Smoove showed up "just to elicit a reaction" from him. 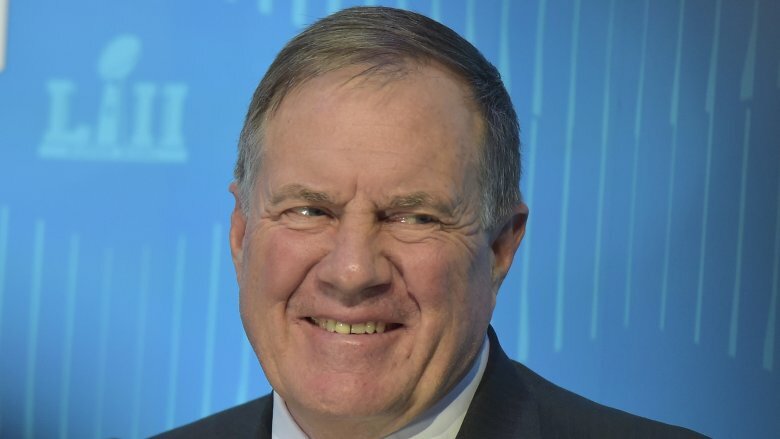 Though Belichick could probably beat the Reaper in a grimness contest, he can also smile and laugh without professional assistance. Reporter Mary Kay Cabot got to know him during his coaching stint in Cleveland and recalled him giving bitingly funny answers to dumb questions. As Belichick's relationship with the media soured, he would become guarded and hostile, but even then he behaved "like "a normal guy" behind the scenes. He played "headbanging rock" while driving and cursed at lunch. Business Insider noted that the world's coldest coach once appeared on a sports comedy show to share his recipe for a peanut butter and jelly sandwich. In 2017 Patriots players told the New York Post that Belichick made them laugh constantly with his desert-dry humor. A former member of the practice squad revealed that much of what the coach said at meetings was probably too adult to print, but it was "funny stuff. And it was every day." But maybe that shouldn't be surprising. When it comes to football, Belichick usually has the last laugh.